Creditors now can declare consumers in default and repossess motor vehicles without court intervention. The enactment in April 2006 of 2005 Wis. Act 255 puts creditors firmly in the driver's seat and leaves consumers waving goodbye to their vehicles and consumer protections. n April 13, 2006, Wisconsin's motor vehicle repossession law changed in a significant way when provisions took effect that allow creditors to repossess motor vehicles without judicial process. This article reviews changes in the repossession law and provides an overview of some of the problems these changes create for consumers, creditors, lawyers, and the courts. In addition, this article briefly discusses how the changes in the repossession law are emblematic of the slow but steady erosion of consumer rights previously enshrined in the Wisconsin Consumer Act. A scenario. To illustrate the significance of the changes in the repossession law, assume you are a general practitioner representing individuals in a variety of areas, including handling the occasional consumer protection case. You have a working knowledge of Wisconsin's law of repossession, enough to know that the law does not take kindly to so-called "self-help repossession," that is, repossession without a court order. One day, a potential client, a single mother of three young children, comes to your office claiming the used car she bought was repossessed from her driveway early that same morning. She had fallen behind in her car payments after being laid off from her job. She received a letter a few weeks ago from the financing company but ignored it because it contained lots of "legal words" and she was preoccupied with looking for work while raising her three kids. She insists that she never received notice of a court hearing or a post-hearing judgment. That she would have paid attention to. This scenario is not far-fetched, given recent changes in Wisconsin's long-standing repossession law. Kelly Anderson is a second year student at the U.W. Law School. Steve Meili (New York Univ. 1983) is a clinical professor and director at the U.W. Consumer Law Clinic. Since its enactment in 1973, and until it was changed in April 2006, the Wisconsin Consumer Act (WCA) prohibited creditors from repossessing collateral or goods without first obtaining a court order, unless the consumer voluntarily surrendered or abandoned the goods.3 Requiring judicial process before repossession provided consumers with necessary due process protections and was consistent with one of the explicitly enumerated purposes of the WCA, namely "to protect consumers against unfair, deceptive, false, misleading and unconscionable practices by merchants. "4 Consumers thus were afforded the opportunity to contest their alleged indebtedness, the validity of the underlying contract, or the creditor's debt collection practices in court. Absent a judicial forum, these legitimate defenses to repossession would rarely be brought. Moreover, consumers, creditors and society in general benefited from the use of judicial process because of the reduced likelihood of violent confrontations that sometimes accompanied self-help repossessions.5 Until April 2006, the creditor's representative or a law enforcement officer typically carried a judgment or court order in hand when appearing at a consumer's residence to repossess property. The court's imprimatur made an orderly repossession more likely. The new law has significant implications for consumers and creditors. First, this amendment overturns Wisconsin's long-standing law of repossession and some of the underlying premises of the WCA. For example, under the old law the creditor was required to prove in court that the consumer was in default and that it otherwise had the right to repossess the vehicle. This requirement was in keeping with the WCA's overall recognition that creditors are more knowledgeable and sophisticated in marketplace affairs than are consumers.19 Now, the consumer either must ask to be sued by the creditor or begin an affirmative action against the creditor to establish that the consumer is not in default or that the proposed repossession is otherwise improper. Apart from the obvious social truism that few people will ever ask to be sued for any purpose, this change marks a fundamental shift in the WCA's longstanding balance between the creditor and consumer. Second, under the new law, creditors are allowed to unilaterally determine that a consumer is in default. Unless a consumer consents to be sued, or chooses to bring an affirmative action against the creditor, the consumer is provided no forum in which to raise concerns regarding the validity of the underlying debt, abusive debt collection practices, and the legality of the underlying contract. In essence, the judicial function of determining the validity of a debt has been transferred to the creditor instead of an unbiased neutral party. Third, the new law greatly expands the scope of "voluntary surrender." In the past, a voluntary surrender had to be truly voluntary; that is, not in response to any kind of a demand or request by the creditor. Now, the law not only authorizes, but requires such a demand for surrender, leaving it up to the consumer to resist that demand by asking to be taken to court. If the consumer does not receive, understand, or otherwise respond to the demand, the consumer is presumed to have voluntarily surrendered the vehicle. Voluntary surrender was once the exception to the prohibition against self-help repossession, but the amendments to the WCA will most likely make "voluntary surrender" the rule. Fourth, the new law requires creditors to include in the Repossession Notice a statement that "if the merchant proceeds in court, the customer may be required to pay court costs and attorney fees. "20 This requirement seems inconsistent with Wis. Stat. section 422.411 (another section of the WCA), which provides that "with respect to a consumer credit transaction no term of a writing may provide for the payment by the customer of attorney fees. "21 The purpose of such prohibitions is to prevent the chilling effect that a threat of attorney fees might have on a consumer's assertion of legal rights.22 This is particularly true in the context of statutes like the WCA that are designed to encourage the private enforcement of individual consumer rights.23 A notice about the possible assessment of attorney fees (which doesn't even indicate that such fees are recoverable only if the creditor prevails) will no doubt make it even more unlikely that a debtor will choose to assert his or her rights. Fifth, the amendments significantly reduce the damages consumers may recover for violations of the repossession law in the motor vehicle context. Although the longstanding remedy for unlawful repossession (return of the vehicle without obligation to pay more, refund of previous payments, and attorney fees) remains in the statutes,24 the remedy likely will be available only in two situations: when the creditor repossesses the vehicle 1) after failing to send the requisite notice to the debtor, or 2) while breaching the peace. Presumably, a consumer is entitled to make post-repossession challenges regarding the alleged indebtedness, the validity of the underlying contract, or the creditor's debt collection practices, but the consumer's remedies in such situations likely are limited to those available under relevant statutory or common law (such damages might be used to offset any deficiency judgment against the debtor). Moreover, if the creditor sends the requisite Repossession Notice via regular mail (that is, not certified or registered mail), it is liable for only $25 plus the consumer's actual damages.25 If the creditor can prove that the debtor received the Repossession Notice, however it was sent, it is difficult to imagine that the consumer will have suffered actual damages as a result of how the creditor posted the notice. Thus, as long as the creditor sends the Repossession Notice in any form, its liability under the new repossession amendment is likely to be limited to $25, a sum hardly sufficient to inspire legal challenges. Finally, one way the amendments could have balanced the interests of creditors and consumers a bit more evenly would have been to require that the Repossession Notice include a statement that following repossession, the consumer might still be liable for a deficiency judgment. Many consumers mistakenly assume that if they voluntarily surrender their vehicle, their problems with the creditor will end. This frequently is not the case, given the substantial outstanding amount that often remains due after resale. Consumers might be more inclined to demand to be sued if they know that they may still owe money to a creditor following a repossession. The amendments require no such helpful disclosure. The repossession amendments discussed above pose several practical problems for consumers, creditors, and their attorneys in addition to those described above. For example, regardless of whether the creditor sends the Repossession Notice via certified or registered mail, many consumers will never receive it and thus never be made aware that their vehicle is about to be repossessed. Moreover, many consumers, particularly those who do not speak or read English, will be unable to understand the Repossession Notice even if they receive it, and thus will not assert their rights within the requisite 15 days, if ever. In addition, the amendment creates ambiguity concerning the content and timing of the Repossession Notice and the consumer's demand to be sued. For example, since the amendment contains no specific drafting requirements for the Repossession Notice (aside from the disclosure about attorney fees described above), that notice could be drafted with the kind of legalese sure to confuse even the most sophisticated consumer. And by what standard is the creditor to judge whether a notice from a consumer constitutes a "demand that the merchant proceed in court," to quote the language of the amendment?26 Given the lack of clarity as to what constitutes a proper "demand," some unscrupulous creditors might be tempted to adopt a high threshold for satisfying this requirement. Similarly, short of sending the demand via certified or registered mail, how will a consumer be able to prove that a creditor received the demand for suit if the creditor denies having done so? For while the amendment affords creditors a safe harbor from liability if they send the Repossession Notice via certified or registered mail, it creates no such safe harbor for the demand for suit sent by consumers. The consumer's deadline for responding to the Repossession Notice and making a demand to be sued also is vague. For example, must the consumer send such a demand within 15 days of the date when the creditor sent the Repossession Notice, or within 15 days of the day the consumer received that notice? And in order for that demand to be valid, must it be received by the creditor within 15 days of the day the creditor sent the Repossession Notice, or must it merely be sent by the consumer within 15 days of the day the creditor sent (or the consumer received) the Repossession Notice? These are the kinds of issues left unresolved in the statute. They are likely to create confusion for both consumers and creditors and thus be the subject of litigation over the next few years. The old law was much clearer: unless a consumer met the threshold for voluntary surrender or abandoned the vehicle, a creditor had to file a replevin action before repossession. How should a practitioner representing consumers or creditors alter his or her approach in response to these changes and ambiguities in Wisconsin's new repossession law? 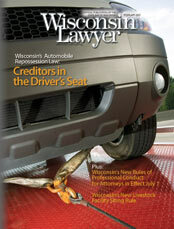 First, creditors' attorneys should advise their clients to strictly adhere to the requirements set forth in Wis. Stat. section 425.205(1g) when sending the Repossession Notice to the debtor. Second, creditors' attorneys should advise their clients that if they breach the peace during a repossession, they risk incurring the hefty penalties described above. Consumers' attorneys must be aware of the narrow 15-day window within which a consumer must act to challenge the proposed repossession. Of course, the attorney may not learn about a proposed repossession until after the requisite 15 days for demanding suit have passed (indeed, the repossession may have occurred before the consumer contacts an attorney). The 15-day window will make it extremely difficult for most attorneys to make a timely demand on behalf of their clients. Nevertheless, this is the best opportunity for consumers and their attorneys to challenge the validity of the repossession or other aspects of the relationship between the consumer and creditor. Sending that demand for suit via certified or registered mail will make it difficult for the creditor to argue that it did not receive the demand in a timely fashion. Consumers' attorneys also may attempt to make post-repossession challenges for unlawful repossession, breach of peace, and underlying debt or contract violations. Moreover, if the post-repossession challenge is based on a fee shifting statute such as the WCA, a successful consumer may be able to collect attorney fees. Because the amendments have made it very difficult for consumers or their advocates to successfully challenge repossessions before they occur, most future litigation over repossessions is likely to center on whether the peace was breached during the repossession. As noted above, the threshold for breach of the peace under the WCA is low, and the remedies are potent. Because judicial process is no longer required before repossession, breaches of the peace are likely to increase. A suit based on breach of the peace also may provide a forum for a challenge to the underlying contract (usually a standard form document that the consumer had no opportunity to negotiate) or the creditor's abusive debt collection practices before repossession (repossession often is the final stage of a protracted attempt by the creditor to collect an outstanding debt). Accordingly, it is good practice for any attorney considering a challenge to a repossession to collect all relevant paperwork, interview witnesses to the repossession, and ask the client to prepare a timeline of relevant events, including debt collection phone calls and other contacts. This spirit of compromise has been sorely lacking in recent years. During that time, consumer protections have been removed from the WCA. For example, agricultural credit has been largely exempted from the WCA,31 and caps on late fees and other charges have been raised or completely eliminated.32 On the other hand, calls for modifying the WCA in ways that would help consumers, such as increasing the dollar threshold for coverage under the WCA (transactions of $25,000 or less) and the woefully inadequate maximum statutory damages (at most $1,000 and in some cases as little as $25) have fallen on deaf ears.33 The repossession amendments continue the pattern, threatening to reduce the WCA to a barely recognizable shell of its former self. 1Wis. Stat. § 425.305; Walser Leasing Inc. v. Simonson, 120 Wis. 2d 458, 462, 355 N.W.2d 545 (Ct. App. 1984). 3Wis. Stat. §§ 425.204(3), .205, .206. 5See A. Richard Immel, The Night Visitors Repossession Practices for Cars Called Unfair to Defaulting Buyers, Wall St. J., July 21, 1970, at 1; Rick Kauffler, The Repo Man Will Get You If You Don't Watch Out, Milwaukee J., Dec. 5, 1971, at 44; Sylvia Porter, Caught in the "Repossession Trap," Chicago Daily News, March 22, 1971, at 38. 8Wachal v. Ketterhagen, 81 Wis. 2d 605, 609, 260 N.W.2d 770 (1978). 9Homa v. East Towne Ford Inc., 125 Wis. 2d 73, 85, 370 N.W.2d 592 (Ct. App. 1985). 11Hollibush v. Ford Motor Credit Co., 179 Wis. 2d 799, 508 N.W. 2d 449 (Ct. App. 1993). 12Wis. Stat. §§ 425.305(1), (2), .308(1). 13Walser, 120 Wis. 2d at 461-62. 19Kett v. Cmty. Credit Plan Inc., 228 Wis. 2d 1, 22-23, 596 N.W.2d 786 (1999). 22See Baierl v. McTaggart, 2001 WI 107, ¶¶ 30, 31, 245 Wis. 2d 632, 629 N.W. 2d 277. 23First Wis. Nat'l Bank v. Nicolaou, 113 Wis. 2d 524, 335 N.W. 2d 390 (1983). 27The Comprehensive Consumer Credit Act was drafted in 1971 and was approved by the Legislature in the 1972 session. The effective date of the WCA was March 1, 1973. 28Kett, 228 Wis. 2d at 17-18 (citing Wis. Stat. § 421.102(2)(b), (c)). 30Jeffrey Davis, Legislative Restriction of Creditor Powers and Remedies: A Case Study of the Negotiation and Drafting of the Wisconsin Consumer Act, 72 Mich. L. Rev. 3 (1973-74); Edward J. Heiser Jr., Wisconsin Consumer Act - A Critical Analysis, 57 Marq. L. Rev. 389, 389-91 (1974). 31Wis. Stat. § 421.202(10) (WCA debt collection and finance charge disclosure provisions still apply to agricultural credit). 331993 S.B. 389; 2005 A.B. 333.